WHAT ARE THE SAN JOSE HOLIDAY EPICUREAN MARKETS? 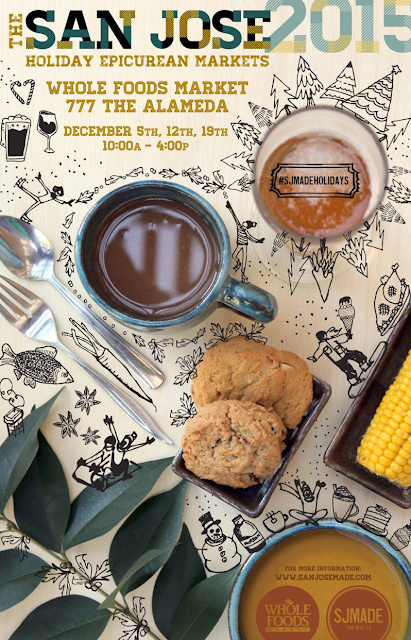 For the first three Saturdays of December, SJMADE will be curating a holiday showcase of San Jose and Silicon Valley's best food/drink makers and food/drink-related makers at Whole Foods Market San Jose. Think of it as a joyous celebration of San Jose and Silicon Valley's foodie, coffee and beer culture. In addition to our amazing local food/drink makers and food/drink-related makers, Whole Foods will have a delicious tasting menu available in the outdoor breezeway space and Mission Creek Brewing will have tasting experiences as well as full-glass experiences available. Are The San Jose Holiday Epicurean Markets for YOU? 1. If you're looking to shop local high-quality food/drink makers for your holiday food shopping, so you and your loved ones can enjoy that super special small-batch sensation, the San Jose Holiday Epicurean Markets are for you. 2. If you like craft fairs for food and drink, the San Jose Holiday Epicurean Markets are for you. 3. If you like high-quality locally made food/drink goods, the San Jose Holiday Epicurean Markets are for you. 4. If you like amazing coffee and beer, the San Jose Holiday Epicurean Markets are for you. 5. If you're down with artisan quality, handmade quality, handcrafted quality then the San Jose Holiday Epicurean Markets are for you. Whole Foods Market San Jose offers the wonderful food shopping experience of all Whole Foods however it also brings its popular coffee and juice bar as well as its amazing on-premises craft brewery Mission Creek Brewing. With tons of comfortable outdoor seating, free WiFi, an indoor cafe and a second-floor terrace with a beautiful view of downtown SJ, Whole Foods Market San Jose has become that chill central hangout for the downtown San Jose and The Alameda community!